As a result of a recent, relatively unusual, trip made by one of the Triskel team, we have thought of a new use for TriskBTT. If you are given the gift of a balloon flight, wouldn’t it be great to have a wonderful visual souvenir of the route you cover on the day of the excursion? If you already have access to TriskBTT and you possess a handheld GPS receiver with data output capability, all you have to do is record the flight in the receiver and, once back on the ground, export the track to a computer and upload it to the Internet (your TriskBTT page). Voilà! A beautiful map with that unforgettable route marked in the colour of your choice. On 4th May, Triskel was present at GenMob - The Smartphone Day, a show dedicated to the latest in mobile technology. Programming workshops for the leading mobile platforms (iOS, Android and Windows Phone 7). Showcase of applications, projects and companies. Networking between businesses and individuals. The convention, with speakers from companies such as Microsoft and the Catalan national television company, TV3, as well as participants in the latest edition of the Mobile World Congress in Barcelona, opened with a presentation by the Generalitat de Catalunya’s Director of Mobility and head of TIC.cat, Sergi Marcén, who talked about the present and future opportunities in the smartphone sector. The conference themes were very wide-ranging and included, apart from programming, banking, gastronomy, e-learning, entertainment, augmented reality, tourism and security. On 15th March 2011, Triskel took part in events at the 5th edition of GlobalGeo, the International Geoinformation Show. 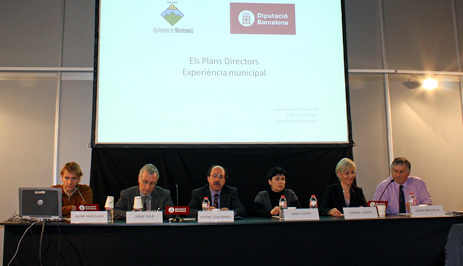 Triskel was one of the invited speakers in a round table session, organised by the Diputació de Barcelona, on the use of computer programmes for processing geographic information in planning and land management at local government level. Before an audience consisting mainly of council leaders and heads of Urban Development, Planning, and Housing Departments, the Managing Director of Triskel Telecom, Josep Baucells, delivered a presentation on our application NavGISweb and how it has been adapted for the Consell Comarcal d’Osona (Osona County Council) to enable them to manage paths, tracks, byways and other rural roads. As part of this presentation, a live demonstration of NavGISweb was given. GlobalGeo is an annual event showcasing the very latest in applications, solutions and technologies in the world of geoinformation and geomatics relating to satellite navigation, land use and urban planning, tracking of vehicles and people, environmental protection, traffic management, security and emergency services operation, etc., all areas in which Triskel offers a wide range of products. Triskel has recently released a new remote station to add to its already large stable. TKERS is a compact station, designed to fit into tight corners and function perfectly under less than ideal environmental conditions. With its own independent power source, TKERS has no need to be plugged in and can carry on working faithfully for many years without human intervention, thus broadening the range of applications for which it can be used. At the beginning of the year, Triskel unveiled this new, redesigned website. We hope you will find it presents a more enjoyable experience and is more informative and easier to navigate. Don’t hesitate to let us know what you think and make any suggestions as to how we could improve it.